Middle Grade. First Edition. Signed. A new series from bestselling publishing phenomenon Margaret Peterson Haddix evokes A Wrinkle in Time and classic Haddix series like Shadow Children, the Missing, and Children of Exile. 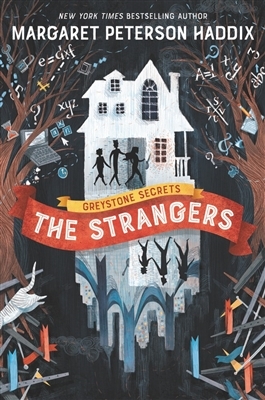 Told in alternating points of view from Chess, Emma, and Finn Greystone, Greystone Secrets #1: The Strangers is the beginning of a new page-turning adventure that examines assumptions about identity, family, and home, from the master of middle grade suspense. The Greystone kids thought they knew. Chess has always been the protector over his younger siblings, Emma loves math, and Finn does what Finn does best—acting silly and being adored. They’ve been a happy family, just the three of them and their mom. But everything changes when reports of three kidnapped children—who share the same first and middle names, ages, and exact birth dates as the Greystone kids—reach the Greystone family. This bizarre coincidence makes them wonder: Who exactly are these strangers? Before Chess, Emma, and Finn can question their mom about it, she takes off on a mysterious work trip. But puzzling clues left behind lead to complex codes, hidden rooms, and a dangerous secret that will turn their world upside down. In this absorbing new series, New York Times bestselling author Margaret Peterson Haddix takes readers on her most thrilling adventure yet.